Before I left for South Carolina the mail came! An order I placed from Handcrafts Online arrived! :) Thanks Mary Kathryn! 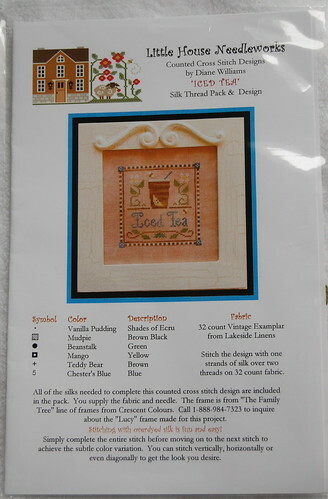 Blue Ribbon Designs "Stitched With Love"
Little House Needleworks "Iced Tea"
I got a couple Barbara & Cheryl Charleston charts along with the new Sampler and Needlework Quarterly. Well, not much else going on! I think I'm going to let Bradley play hooky Monday, so we can stay an extra day up here. Aren't I a bad mom?? :) Write later! Wonderful new items for your stash! I'd love to be able to go through all those old designs up in Summerville!! Makes me homesick for Charleston, just seeing some of the pictures on the front of the new charts. I love your new stash. I've been on a stitching slump lately, but I still enjoy looking at your work. :) Such an inspiration that moms can still find time to stitch. I am seriously in love with your blog! 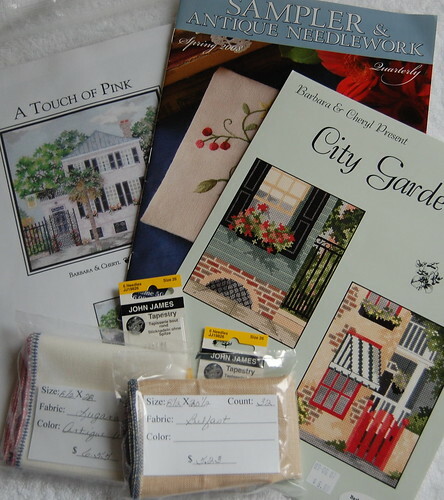 You have amazing pictures of your stitching! 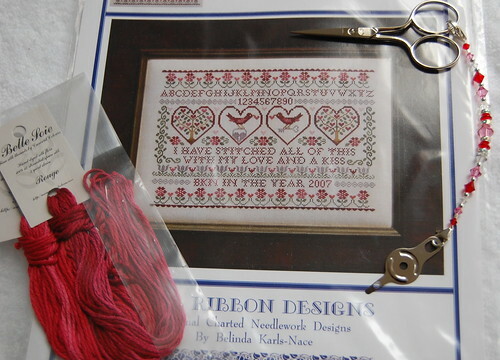 I can't wait to see that Blue Ribbon Designs pattern finished - it looks amazing! Love you stash!! Great selection. I love reading your blog. You are so much like me and such an enabler. Great new stash, LHN are my favourite! Have fun playing hookey! I tried to convince my kids last year on an especially cold and snowy day to play hookey, but they all wanted to go to school...talk about role reversal, lol!!! Great new stash! Love the Blue Ribbon chart! Did I tell you before that my mom lives in Summerville. It was April of 2006 when I was up there visiting her and I just love it there (I didn't get to visit the LNS), she lives in the sweetest neighborhood. I finally got her to visit her Summerville LNS and buy me some charts this last summer when my daughter was up there visiting. My mom doesn't stitch or anything like that so it's like a foreign place for her. How I wish I could live there.